Museum in Marylebone focusing on the history of British dentistry. 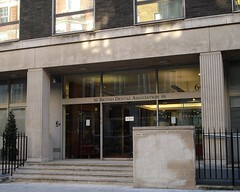 It's located in a single small room at the headquarters of the British Dental Association on Wimpole Street in Marylebone, and open for only six hours a week (1pm-4pm Tuesdays and Thursdays, as of February 2019). Admission is free. The museum was established in 1919 on the basis of a small collection donated to the Association by Lilian Lindsay, the first woman to qualify as a dentist in the UK. It now has custody of around 30,000 items, though due to space constraints only a fraction of these are on permanent display. The permanent exhibition is a mixture of storyboards, dental instruments photo, illustrations photo, illustrated casebooks, dentures through the ages, and so on. Pride of place is taken by a vintage dentist chair featuring a treadle-operated drill photo. Temporary exhibitions are housed in two display cases, one in the BDA foyer and one in the basement, and change roughly four times a year. On our March 2010 visit, the temporary exhibition focused on Sir John Tomes, a pioneer in dental research. Past exhibitions have included women in dentistry, the history of orthodontics, and NHS dentistry. Accessibility: Ramp to get into the building (to the right of the steps). Level access to the museum once you're in. One of the display cases housing the temporary exhibitions is in the basement down a flight of spiral stairs; according to the BDA website there's a lift, but we didn't check this. The permanent exhibition is well-lit and mostly accessible to all heights, but the display case in the basement is less well-lit, and if you're below average height you may have trouble viewing some of the items there. A PDF with access information is available on their website. Last visited by Kake, March 2010. Opening hours taken from the British Dental Association website, February 2019. Last edited 2019-02-06 14:43:42 (version 4; diff). List all versions. Page last edited 2019-02-06 14:43:42 (version 4).